To obtain the latest NSSP results, click here. 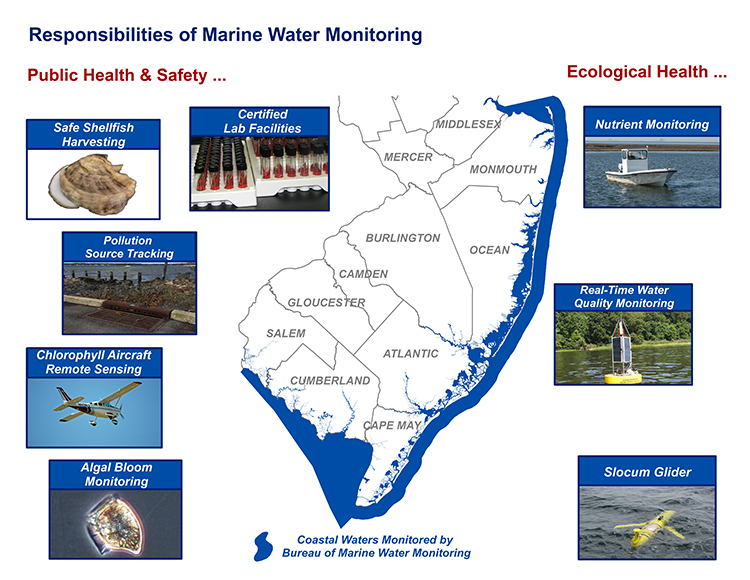 The Bureau of Marine Water Monitoring is involved in many aspects of the State's coastal water quality for both public and ecological health. Its roles include monitoring for compliance with the National Shellfish Sanitation Program, coordination of coastal bathing beach monitoring, removal of trash from coastal beaches, evaluation of the ecological health of the coastal waters, and monitoring to identify and track pollution sources impacting the State's coastal waters. Don't forget to join our email subscription. Some files on this site require Adobe Acrobat PDF Reader to view. You can help keep the New Jersey shore clean and preserve it for future generations by purchasing a "Shore to Please" coastal protection license plate. Family memories are made at the New Jersey shore. Keep these memories bright with CLEAN oceans and beaches. These plates support New Jersey shore cleanup programs. To order a "Shore to Please" license plate, click here. Click inside popup to close it. To purchase this license plate, click here.